Hong Kong is a great place for kids of all ages and there are many things to do that will keep everyone happy and entertained, from ferry rides, big buddhas, thrilling roller coasters, cuddly pandas, bargaining at markets, fun foods, and yes, even Mickey Mouse! It might seem overwhelming at first, this is after all, one of Asia's big metropolis where everything happens at whirlwind speeds, and on the other hand, the kids will also marvel and experience the old Chinese traditions and ways of life. 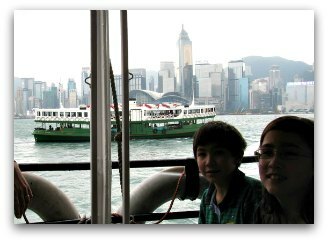 Hong Kong is one of the easiest (and most inexpensive) places to get around, a fact you will certainly appreciate when traveling with kids. Challenge the kids to find all the different ways to get around! What about the food? Even the most picky eaters will be in good hands here. Noodles and dim sum not your thing? Hong Kong being an international city, caters to all and at all budget ranges. Worst comes to worst, there is always the Golden Arches. Here's our guide to food in Hong Kong. And even in the most crowded of places where you feel you are surrounded by skyscrapers and people, there are always green open spaces dotted around the city, great places for taking a break from the hustle and bustle and for the kids to run around and unwind. Try not to cram too many things, Hong Kong is not a city you "see" or "do", you experience, and experience to the max, assume you will be back! While all areas in the city are family-friendly, the challenge in Hong Kong is to find roomy accomodations. 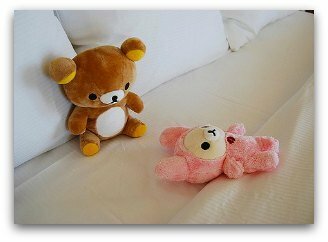 In a city where land is at a premium, you can expect smaller room sizes all-around, single and twin rooms are common, but triple, quad, and family rooms somewhat scarce. 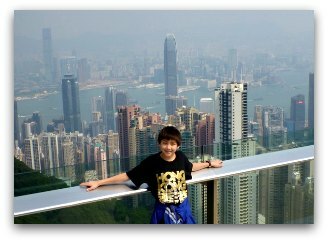 Victoria Peak is Hong Kong Island's highest point, the views from here are legendary. 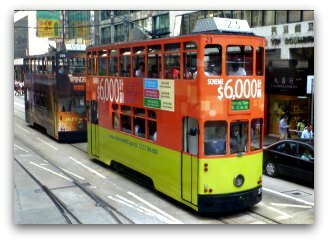 The fun way to get to the summit is of course with the Peak Tram, the old iconic trams have been around for over a century, so yes, you are riding on a piece of history. Another of Hong Kong's relics, these unmistakable green and white double-deckers have been shuttling residents for over 120 years. 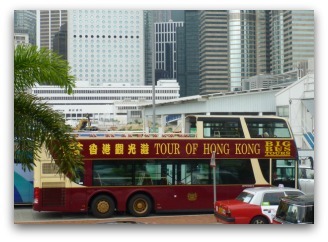 It was once the only way to get to and from Hong Kong Island and the mainland. The Star Ferry runs continuously, there's one leaving every 10 minutes or so. Check out the crewmen handling the ropes and still wearing their old-style sailor outfits. 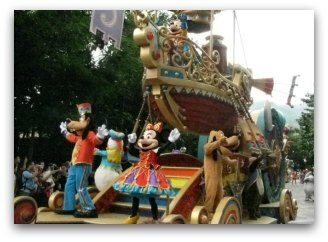 Come say "Ni Hao" to Mickey, Minnie, Goofy and the Gang! The small size of the park and family-friendly set up makes it a perfect place to spend the day with small children. Particularly for toddlers and children under 10, the park will be a very magical experience. And beyond the animals, we have a fantastic cable car and many many rides and roller coasters. This park is a great alternative to Disneyland if you have teenagers. In addition, Ocean Park offers a range of one-of-a-kind experiences that the kids will enjoy: scuba diving among sharks and rays, dolphin encounters, panda keeper for a day, etc. 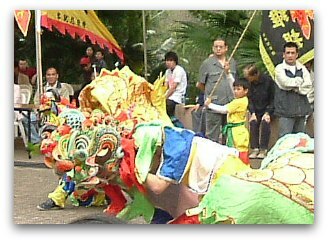 Lion Dances and Dragon Parades are a fundamental part of any Chinese festivity. 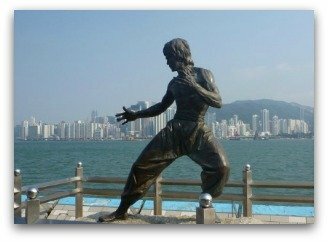 If you won't be around during any of the many festivals celebrated year round, then check out the Kung Fu Corner every Sunday afternoon at Kowloon Park. Sponsored by the HK Leisure and Cultural Services Department together with the many martial arts and kung fu associations, the event is free and open to all. In many cases, kids get to try out their skills as well! 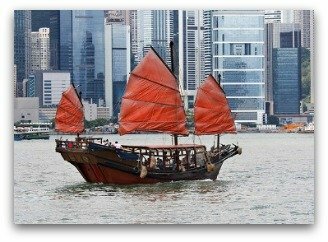 The Hong Kong junk has come to represent the old traditional values that are still so ever present in this cosmopolitan city. The sight of this venerable vessel with its flashy red sails set against the backdrop of an ultra modern skyline is certainly striking and it has become a cherished symbol of the city. 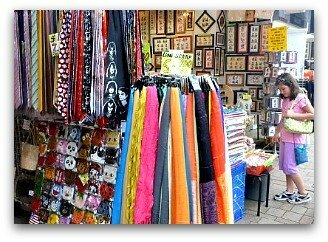 Hong Kong Markets are colorful and lively, kids will love tripsing around, shopping and trying their bargaining skills. Try to visit at least one market during your stay, chances are, there will be one just around the corner. Kids love sitting on the open top Hop-On-Hop-Off bus and cruising around while you pass through the city's skyscrapers and on to the more picturesque corners. See something you would like to explore further? Hop-Off and enjoy! Then get back on to continue exploring. Gives you more flexibility than a normal sightseeing tour since you go at your own pace, stop for breaks when the kids are getting tired or hungry then rejoin when you're ready. 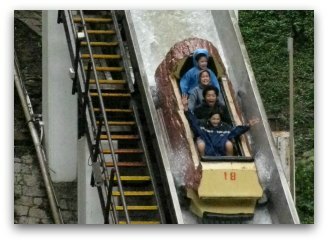 There are also "Family Packages" for 2 adults / 2 children where practically the second kid goes free. 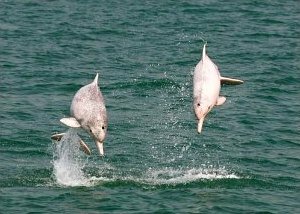 Children really enjoy the cruises which provide not only a way to enjoy and observe these lovely creatures in the wild, but also give you a little break from the hectic pace of the city and see a bit more from the surrounding areas. 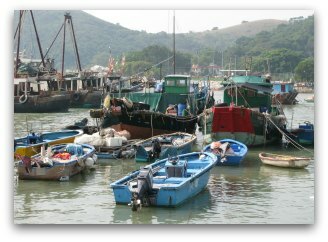 There are a handful of traditional fishing villages not far from the hustle and bustle of the heart of Hong Kong. Kids will love the ambiance, so different from the city, rows upon rows of the old-fashioned junks and sampans, house boats where the fishermen and their families still live, houses on stilts and lively markets where the day to day routines unfold. Kids love the rickety rackety Ding Ding Trams. They are as old as they sound and each ride costs only a few cents. 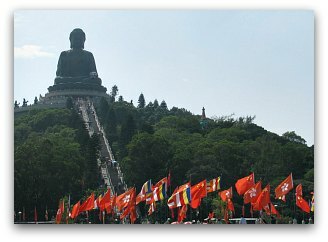 We like to take it from Central to the old neighborhood of Sheung Wan so in minutes you are transported from the glitz and glam of the skyscrapers and luxe business district to the old alleys lined with dry food markets, traditional medicine shops, tea houses and temples. Get off and walk around, this area is always lively and fun to people-watch. The Ultimate Kid Culinary Experience: Hello Kitty Dim Sum! It's Hong Kong's staple and all manner of Cantonese delicacies transformed into a delightful experience for fans of the popular cartoon. 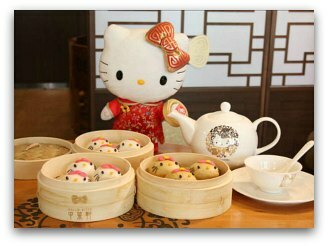 From Hello Kitty Char Siu Paos and Hello Mimmy Vegetable Dumplings... the first Hello Kitty Restaurant in Hong Kong, located in Jordan, is a "do not miss" for all Hello Kitty fans, young and old.